I arrived both times in Hong Kong by flying into Chek Lap Kok International Airport late in the evening. 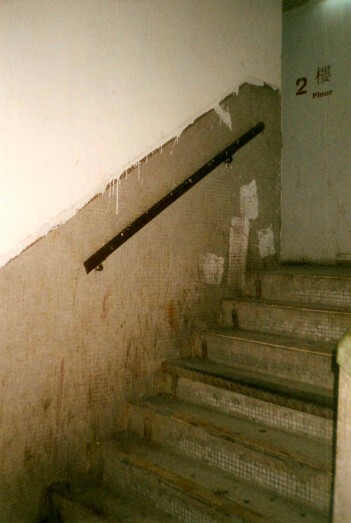 I had no reservation and little plan beyond taking a train or bus into the city and going to the Chungking Mansions and seeing what the touts would offer. Yes, the company I was teaching for would pick up the bill for a nice room in a business-oriented hotel, but only for the period of the course itself. And the Holiday Inn on Nathan Road in the Tsim Sha Tsui area of Kowloon is pretty much like a Holiday Inn anywhere. Meanwhile you could have a far more immersive experience (for a tiny fraction of the price!) just a block down Nathan Road at the Chungking Mansions. Hong Kong is an irregularly shaped peninsula and a cluster of islands, two of them 10 to 20 km long, at the mouth of the Pearl River. People lived in the area over 30,000 years ago. Archaeologists have found stone tools and possibly a specialized tool-making site on the Sai Kung Peninsula, plus what have been interpreted as religious carvings on stones on outlying islands. The Yue people, a non-Chinese people believed to be of Austroasiatic background, were living in the area before 214 BC, when the area was incorporated into Qin Dynasty China. The Tuen Mun area had been occupied since the Neolithic era. A major trading and naval port was established there during the Tang Dynasty in 618–907 AD. Portuguese explorers and merchants started arriving, starting with Jorge Álvares in 1513. They also started settling and fortifying the Tuen Mun area. With the establishment of the Qing Dynasty in 1644, the Portuguese were driven out. The Great Clearance ordered by the Qing Emperor Kangxi in 1661–1669 forcibly evacuated the coastal areas of Canton, now called Guangdong. 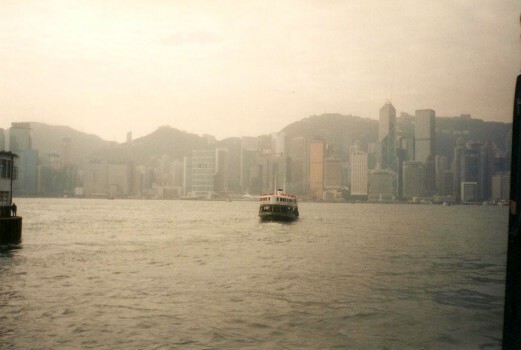 The peninsulas and islands of today's Hong Kong were mostly deserted. In 1685, Kangxi opened limited trade with foreigners in Canton under tight restrictions. Foreigners could only be in Canton during the trading season, they could not import firearms, warships, or women, and all payments had to be made in silver. The British began trading in Hong Kong in 1699. They quickly began importing opium, which they produced in Britain and India, and exporting tea. Trade grew rapidly. This led to the First Opium War of 1839–1842. It ended with the Treaty of Nanking in 1842, which gave Hong Kong to the British. Trade grew but didn't satisfy the British, leading to the Second Opium War of 1856–1860. Until the 1842 treaty, ​​​​​香港​​​​​ or Hong Kong, meaning Fragrant Harbor, referred to a small inlet on the south side of Hong Kong Island, what is called Aberdeen Harbor today. The name was often written Hongkong until 1926, and some businesses including the Hongkong and Shanghai Banking Corporation still use the older spelling. Place names in Mainland China are usually spelled using Mandarin-based Pinyin Romanization. That would make it Xiānggăng, but for tradition's sake Hong Kong remains the official Roman spelling. Imperial Japan brutally occupied Hong Kong from 23 December 1941 until Japan's final surrender on 15 August 1945. The UK then resumed control. Hong Kong's population grew rapidly after the war, with a flood of refugees from China fleeing the civil war and the following communist rule. Many foreign firms moved their offices from Shanghai to Hong Kong, eventually turning Hong Kong into the third largest financial center in the world, after London and New York. The Convention for the Extension of Hong Kong Territory in 1898 gave the UK a 99-year lease on the New Territories, which was all of Hong Kong except for Hong Kong Island and the small Kowloon Peninsula. 1898 + 99 = 1997. The UK handed Hong Kong over to the People's Republic of China in 1997, to be handled under the concept of "One country, two systems". You will have arrived at Chek Lap Kok International Airport, on the north shore of Lantau Island as shown on the map above. The old Hong Kong International Airport was famously right in the middle of the city, requiring very careful maneuvering over the high rises. See the map below for where the airport used to be. The new Chek Lap Kok airport was built on reclaimed land in the bay along the north shore of Lantau Island. 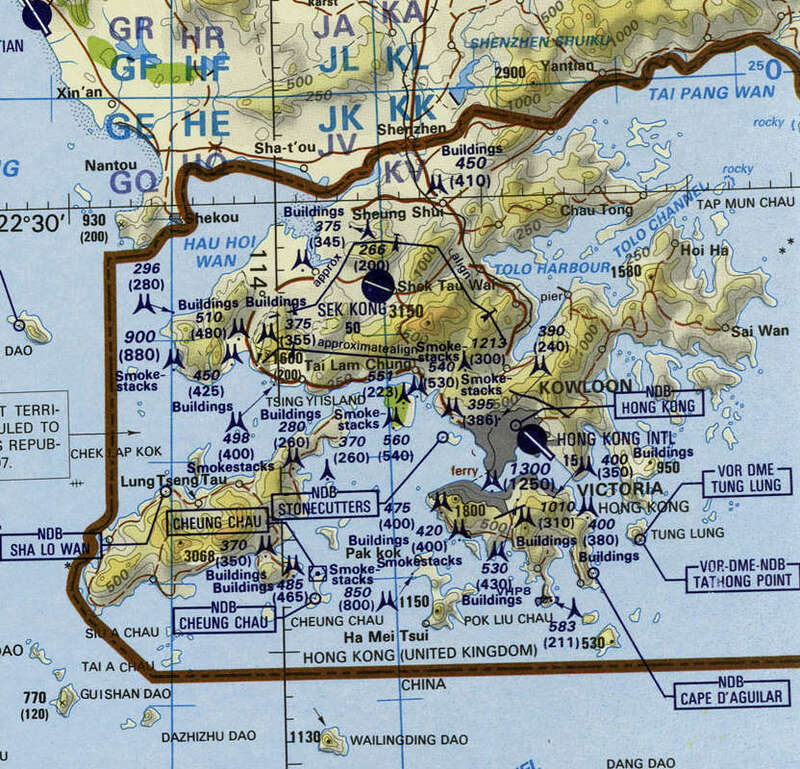 The small island of Chek Lap Kok in the map above forms the northeastern end of the new airport complex. Fast buses and a high-speed train connect the airport to Kowloon via tunnels. The Airport Express train stops at Kowloon station, on the west shore of that peninsula, express buses take a little longer but drop you at a more convenient location close to the tip of Kowloon. Kowloon or ​​​​​九龍​​​​​ is the heavily settled peninsula shown in grey above, extending from the mainland toward Hong Kong Island. The wonderful Hong Kong harbor is the strait between the large Hong Kong Island and the Kowloon peninsula. The name was transcribed Kau Lung, Kau-lung, Kauloong, and Kawloong before the 1940s. It means the Nine Dragons, referring to eight mountain peaks plus the Emperor Bing of the Song Dynasty. Tsim Sha Tsui or ​​​​​尖沙咀 (pronounced "Jim Shaw Joy" and often abbreviated "TST") is the tip of the Kowloon peninsula. It is a center for tourism, with accommodations from cheap guesthouses to the very top end. The Peninsula Hotel, famous for its fleet of Rolls-Royce limousines and now the flagship of a chain of high-end luxury hotels, takes its name from its location at the very tip of the Kowloon peninsula. 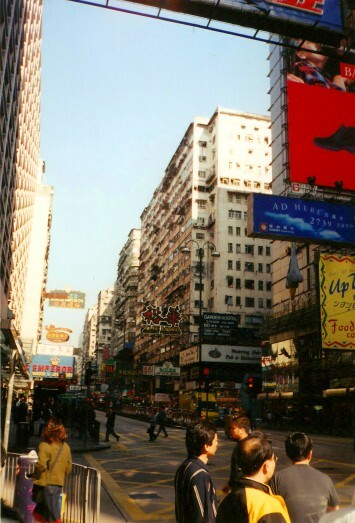 Nathan Road is the main street through Tsim Sha Tsui, running north from the southern tip of the Kowloon peninsula. The Chungking Mansions are at #36–44 Nathan Road, just a couple of blocks north of the south end of Nathan Road, the Peninsula Hotel, and the Star Ferry pier. The Chungking Mansions are a 3-D labyrinth of apartments, guesthouses, restaurants, and shops built in a 17-story apartment building. You walk in off the street into a maze of passageways filled with money-changing booths and tiny shops — food, clothing, low-end electronics, much like a not particularly nice Turkish bus station. Looking north up Nathan Road in the Tsim Sha Tsui district of Kowloon, Hong Kong. 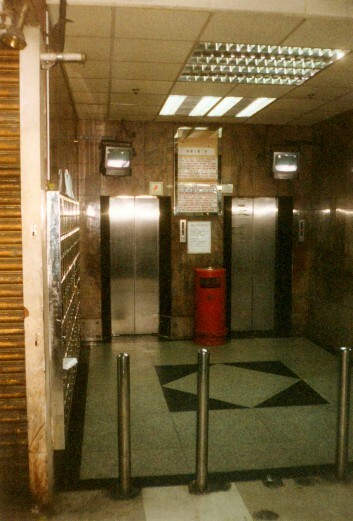 The entrance to the Chungking Mansions, 36-44 Nathan Road, Kowloon. The first floor above the entrance level (what Americans would call the "second floor") is directly reachable by stairs from the ground floor, and after you get used to the clutter you realize that not only are there signs hanging out over the passageways as if they were small alleyways, but there are openings up to balconies on the first floor. Up there are more shops, tiny restaurants, and a couple of barber shops. 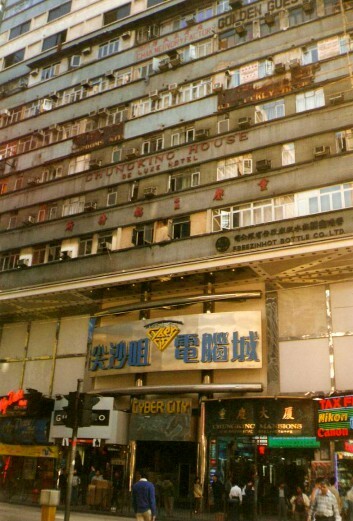 The Chungking Mansions were completed in 1961. There are now about 4,000 people living there permanently plus all the transient budget travelers. The many guesthouses has over 1,900 small but functional guest rooms. 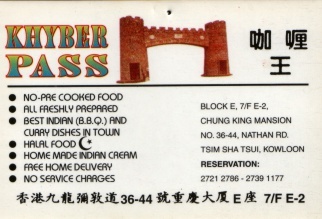 Plus, there are many small Indian and Nepalese restaurants throughout the building. Two stations of the MTR, the Mass Transit Railway, are nearby. Some of the airport buses stop directly outside on Nathan Road. There are five pairs of elevators, and one of each pair stops on the even floors 2-16 while the other stops on the odd floors 3-15. The pairs are labeled A through E, and thus the terms "A block" through "E block". The hallway on any given floor within one block is fairly small, with maybe just five to ten doors off it, and you can't get to the equivalent floor on another block. You have to go back down to the ground floor and up another elevator. Very few places in the Chungking Mansions have windows, and many that do probably just look out into window wells. The building was originally intended as entirely residential above the bottom two floors. But people started converting apartments or pairs of adjacent ones into guesthouses and restaurants. It's still largely residential, but there are lots of places to stay and get good meals. The guesthouse rooms are quite small. If you're tall, you'll find that even though the bed is as long as physically possible in the room, it's still too short. Even when you lie diagonally. So, the beds are a little smaller than at the Whitehouse Hotel in New York. But on the positive side, you get your own toilet and shower. 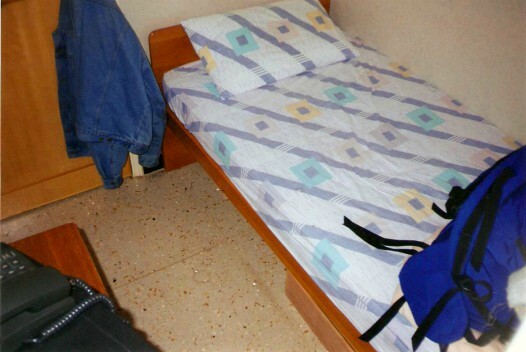 A spare bedroom in the guesthouse manager's apartment. A view of the room from the door. The bathroom is unusually large for a guesthouse! Fortunate Guesthouse, A Block, 11th floor, +852-2366-5900. New Grand Guest House, C Block, 13th floor, +852-2366-7724. Taiwan Hotel, A Block, 3rd floor, +852-9858-5034. 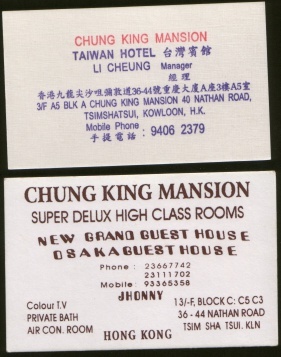 Business cards from Chungking Mansions guesthouses. The Fortunate Guesthouse was the first place I stayed. The tout on the sidewalk was the manager — the guesthouse itself was full but he rented me a spare bedroom in his apartment for HK$ 180 a night. Tiny but nice, it was a bedroom and attached bathroom. The bedroom floor space was half occupied by a small bed, and much of the rest was taken up with a chest of drawers holding a TV and a telephone. 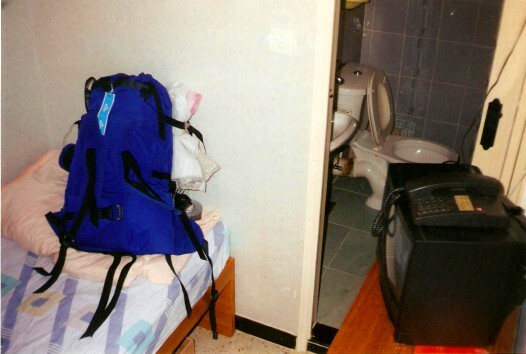 The bedroom was about six feet long by five feet wide, and the bathroom was smaller. The chest of drawers blocked slightly less than half the door into the bathroom. A standard porcelain toilet, and the integrated shower arrangement where the room itself was the shower. The telephone was sitting on the bed when I arrived, as the jack was on the wall above. If you placed the phone on top of the TV and hooked the cord over the bathroom door frame, it worked out. He showed me that the TV power plugged into the outlet in the bathroom, so it dangled through the doorway about knee-high. So, entering the bathroom during TV time required first stepping through sideways to fit past the chest of drawers, and then stepping high to get over the TV power cord. The New Grand Guest House rented me a room with a wide but short bed, a phone, a TV, air conditioning, plus a toilet/shower/sink cubicle. The bed was built right against one wall, and there was just enough room to walk between it and the other wall. But that's all you really need. The guest house consists of an entry hall (which apparently has been, or perhaps still is at times, a barber shop or beauty parlor), with four bedrooms off a narrow hallway. Almost all the restaurants are Indian, Pakistani, or Nepali, and the food is excellent. Some look pretty dire from the hallway, but most are far cleaner inside than the exterior would suggest. There are some places on the first floor overlooking the entrance level where you can get breakfast while avoiding the "English Breakfast" prepared by people from the Indian subcontinent while living in Hong Kong. That does make it quite the British Empire experience, and may be your only chance for baked beans during the day, but it wasn't what I was looking for. Ser-E-Punjab for chana puri (spicy lentils) and tea. Nepal Fast Food for poori bhaji (spicy potato curry), puff bread, and tea. Everest Club, D Block, 3rd floor. The best curry shop I found there, I returned several times. Taj Mahal Club, B Block, 3rd floor. Another of the better places there, I went back several times. Khyber Pass Club, E Block, 7th floor. Swagat, on the first floor off one of the balconies overlooking the bustling ground floor. Some of these advertise having halal food, meaning among other things that they serve beer but you have to ask. It will come Chinese style, meaning an huge (650 ml) bottle of Carlsberg or similar. Speaking of portion sizes, in Hong Kong they're enormous. I got a carry-out Thai style curry for lunch one day while teaching the class. It came in a large styrofoam container for the curry and a smaller one for the rice. The price had seemed reasonable for a single meal, and I was a little embarrassed to take what seemed to be food for an entire family back to the classroom. But one of the students explained that no, that was the normal sized Hong Kong lunch. 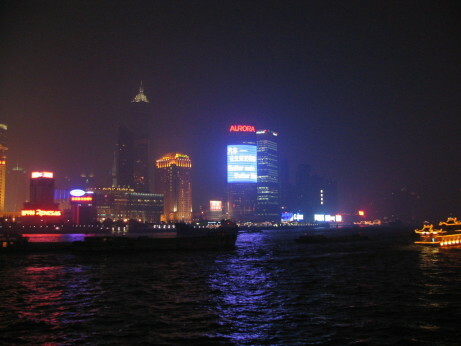 Looking across the harbor from Kowloon at night. The Kangaroo Pub is popular with the large expatriate British Commonwealth community. It's upstairs on Haiphong Street, a side street off Nathan Road. You can sit at the windows and watch the huge crowds of people below. From the Chungking Mansions it's just a few blocks down Nathan Road through Tsim Sha Tsui to the waterfront and the open Promenade area at the tip of the peninsula. There are great views across the busy harbor to the Central district of Hong Kong Island. The views across the harbor are great at any time, although they can be a bit hazy during the day. It's really spectacular at night, when many of the tall buildings are outlined or covered in animated multicolored light systems. The Star Ferry at the Kowloon pier. The Star Ferry crossing the harbor from Kowloon to Hong Kong Island. The MTR is the fast subway system connecting Kowloon and Central, but it's an unsurprising subway. The Star Ferry is a much nicer way to cross the harbor. It's just HK$ 2.2 for a ride. For the job on-site at the telecommunications company, I stayed at the Holiday Inn in Tsim Sha Tsui and traveled to their site in the eastern Central district by crossing the harbor on the Star Ferry. Then it was a ride on MTR for several blocks from the ferry dock to their offices in the Times Square complex. There's a certain romance about being able to say you've commuted to work on the Star Ferry. 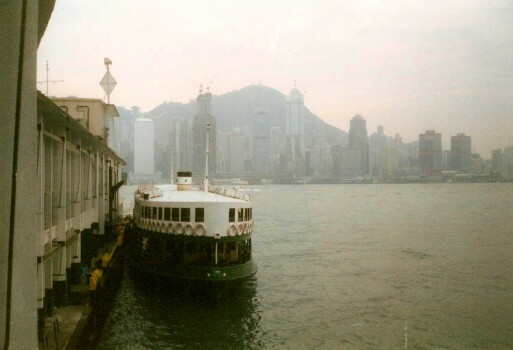 The Star Ferry line has been crossing the harbor between Tsim Sha Tsui and Central since 1888, changing its name to the Star Ferry Company in 1898. 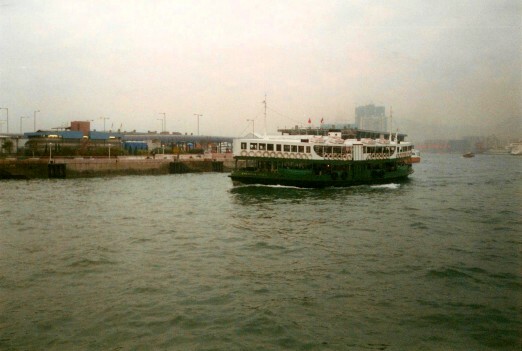 It was the main form of public transporation across the harbor until the MTR cross-harbor tunnel began operation in 1972. The twelve ferries still carry over 70,000 passengers a day. The Star Ferry pulls into the Central pier after crossing Hong Kong harbor. For the second job, I was working in Central and staying in the Sheungwan district well west of Central on the Island. That meant just taking the tall and narrow double-decker streetcars to the job site and back. But most evenings I took the Star Ferry across the harbor to get dinner, to see the lights of Central from the Promenade, or just to ride across and back again. It's a great setting — like İstanbul as far as being a huge city with dramatic architecture split across a very busy body of water, but Hong Kong is entirely different as it's ultra-modern, backed by green mountains, and East Asian. The obvious thing to do in Hong Kong is to take the tram to Victoria Peak for the fantastic views. You look down over the big business buildings of Central, across the harbor, the Kowloon peninsula, and on to the hills of the New Territories in the distance. The daytime weather was very hazy both times when I was there in December. Very hazy at best, cloudy with rain some of the time. As you can see from my picture, it was not as pretty as the postcards but it was still a great view. 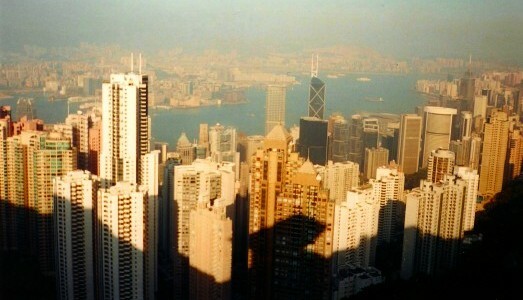 A view down over Hong Kong from Victoria Peak, as taken with a US$ 10 camera on a hazy day. Fantastic image from Wikipedia, a night view of Hong Kong from Victoria Peak. This is someone else's image, which they enhanced with a form of localized histogram equalization. The Lan Kwai Fong area is more trendy, with plenty of places to get meals. It's not too far from the Times Square office complex, and it's packed during lunch time. The back streets of Hong Kong are just one fez-monkey short of Archie McPhee. The night markets are enormous surplus sales set up on folding tables in the streets. Prominent night markets include the Temple Street and Mong Kok night markets, and the big Night Market north of the Tsim Sha Tsui area. The markets have everything you ever wanted, especially if all you really wanted was ballpoint pens, alarm clocks, acres of "Hello Kitty" paraphernalia, miles of cheap neckties, padded pajamas and robes (in case you can't decide whether to fight or sleep), children's kimonos, battery-powered waving cat statues, lighters, Osama bin Ladin T-shirts, Mariah Carey T-shirts (but no "Osama ♥ Mariah" T-shirts), and vast arrays of what would appear to be bootleg "Greatest Hits" albums by western musicians but are really covers by Philippino bar bands. The day markets continue this theme indoors and during the day. I stayed in the Sheungwan district during the second course. The scent of Sheungwan is a pungent blend of curry, liniment, rancid fish, incense, and naphthalene. Sheungwan is full of traditional Chinese medicine and health food shops. Lots of sea life dissected and dried, some recognizable (dried seahorses), some barely so (dried shark fin cartilage), and some not at all (various grey lumpy fungoid things). There are also plenty of small restaurants, and stores with clothes, kitchen utensils, small electrical appliances and so on. Plus, the famous Man Mo Temple, up the steep streets. 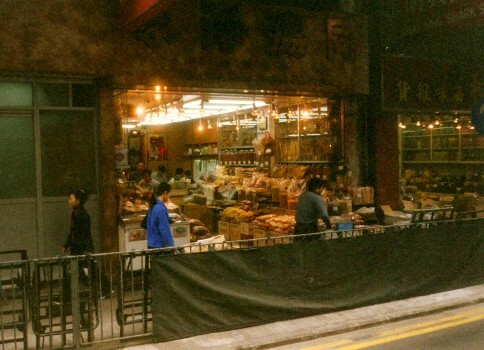 Stores with traditional medicines in the Sheungwan district. Bank of China HK$ 20 bill. Standard Chartered Bank HK$ 20 bill. The currency in Hong Kong can be a little confusing, as multiple banks issue bills. There are three sets of currency in circulation at once, issued by three banks following their own designs. Two-thirds to three-quarters of the circulating currency is the HSBC notes. The Bank of China and Standard Chartered Bank notes split the remainder. All the bills of a given denomination are the same color, like the blue-green HK$ 20 bills seen here.